This is the month that I shopped the hell out of Target, to include the same pair of shoes in FOUR COLORS because I have zero self-control around a reasonably priced, on-trend, comfortable shoe. Sigh. I know. Judge me, and then look at how cute my shoes are. Aerosoles High Hopes Sandal in Light Tan (originally $79 a pair, paid $56): I love the styles coming out right now for sandals, but I need comfort! I saw these on the Aerosoles website, but I ended up buying via Amazon for a little bit less. They're comfy and on trend, and I can't wait to wear them with my dresses as the weather warms! Merona Poppy d'Orsay Pointed Toe Flats in Tan, Black, Cobalt, and Tomato Red (originally $23 per pair, paid $35 for two pairs... twice): YES I AM RIDICULOUS. These shoes are soooo cute, and with the BOGO 50% deal happening I ended up with FOUR PAIRS. I love them, and they're comfy for work. I wear them all the time, and they're a great buy. Victoria Beckham for Target Black Satin Photo Top and Skirt ($28+$30): I went into the Target nearest to me, a small one, when they opened with this collection from Victoria Beckham. I originally went in with a few tops in mind, but the top I ended up falling in love with was this floral top. It's not my ordinary style, and based on the preview it wasn't one that I anticipated trying, but I put it on as a whim. I loved it on! Target Softest Crew Tee (paid $8 on sale): This was super soft and reminded me of a Lularoe Tee. Xhilaration Placed Print Tank with Roses (originally $20, paid $15 after discounts)? : This just looked pretty. Great summer top in a nice print. H&M Jacket ($45 via Poshmark): This white jacket with faux leather insets just felt like a great layering piece for work. Purchased it used via Poshmark, and paid shipping on it. I don't wear my white denim jacket enough, but I feel like this one has edgier style and will get more wear. I also restocked my Poshmark closet to make some money back on clothes I don't wear, and it is working! Sold a decent amount this month. I've tossed shoes and clothes, bagged them up for donation, and put the rest in the Poshmark bin. I feel better and better about how my closet is shaping up, even though I'm totally still buying things. 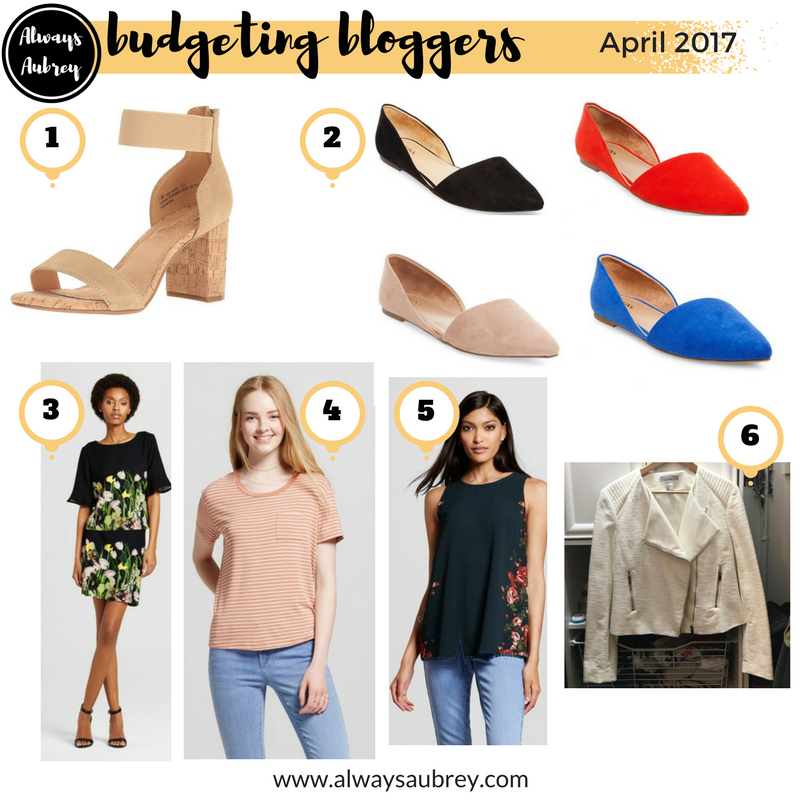 I'm linking up with the rest of the Budgeting Bloggers at Franish! What did you add to your closet this month?